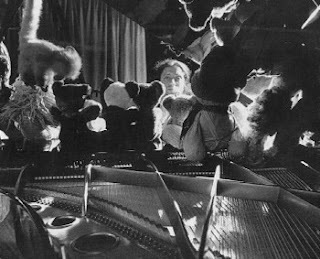 Today's Composer of the Day is Charlemagne Palestine. Charlemagne Palestine is a rather odd fellow. Musician, composer, performance artist, and eccentric, he was active in the 1970s, and is still around today. His music explores vocal and piano timbres, drones, minimalism, electronics, tape, chant, exotica, crossover with pop, trance, ritual, and various physical elements of performance art. The ritual elements of his performances include, but are not limited to, being surrounded by large numbers of stuffed animals, smoking copious amounts of clove cigarettes, and drinking remarkable quantities of cognac. You can see some recent footage here. You should listen to his music, which is very visual. What? I know the atmosphere is probably relaxed, given the bears and the awesome hat, but in the reflection of the piano (ca. 45 sec) I swear there are two people making out quite vigorously. Was Charlemagne Palestine the name he was given at birth, or the name he chose later? I assume the latter, but if not... his parents were both awesome and very, very strange. It is an assumed name, check the link to his wiki page, I think it has his given name, which is as unsure as his birthdate year. Which is awesome. I think you'd dig him, even if only for about 20 minutes. A true weirdo. Gotta love it.